An angry Mr Howes (one of the rescued swimmers) said whoever mutilated the dolphins should be castrated. "In light of what has happened at Ocean Beach I would give them a taste of their own medicine," he said. "This is how we repay them for their help?" Oh man, I’m with him. Though it might be more interesting to toss ’em in the water and let the sharks take care of matters. POACHERS in New Zealand may have killed two members of a pod of dolphins that recently saved the lives of swimmers from a great white shark attack, lifeguards said yesterday. Staff from New Zealand’s Department of Conservation (DOC) believe the dolphins died about two weeks ago after drowning in fishing nets set out by criminals poaching fish. DOC officer Richard Parrish said their tails had been hacked off, probably to free them from the net. Three weeks ago, seven dolphins protected Ocean Beach lifeguard Rob Howes, 45, his 15-year-old daughter Nicky, 16-year-old lifeguard trainee Helen Slade, and Karina Cooper, 15, from the jaws of a great white shark at Ocean Beach, Whangarei Heads. The protective dolphins have been hailed as the humans’ saviours after the incident was reported this week. Mr Howes was on a training swim with the teenagers to mark Helen’s first day as a lifeguard. The group was 100 metres from the beach when around seven agitated dolphins appeared. The pod formed a protective shield around the swimmers and even herded Mr Howes back when he tried to swim away. The girls thought the dolphins were playing as they swam round them in tight circles, thrashing their tails, but Mr Howes finally spotted the outline of a 10ft great white. The dolphins warded off the shark for 45 minutes and only when it moved off did they allow the swimmers to head for the shore. The discovery of the dead dolphins has outraged the local community and shocked Mr Howes and Miss Slade, who feared the two mammals may have been a part of the pod that saved them. 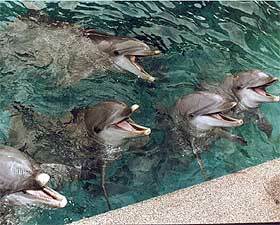 An angry Mr Howes said whoever mutilated the dolphins should be castrated. He said setting illegal nets where dolphins could get tangled up in them amounted to "indiscriminate murder," and added that the discovery would put a lot of fishermen under pressure. "There will be a public outcry against the use of nets," he said. Miss Slade said she was disgusted to hear what had happened to the dolphins. "Why would they do such a thing?" she asked. Fishing with illegal nets, failing to report finding a dolphin in a net, and mutilating a marine mammal are all offences carrying a maximum 10,000 New Zealand dollars fine. Bay Of Islands SPCA inspector Jim Boyd said fishermen needed to change their habits and not set nets where dolphins could be caught. "(Dolphins) drown in the nets because they cannot get to the surface for air," he said. Mr Boyd called on the Government to impose legislation to protect the dolphins. "If (illegal netting) doesn’t stop then dolphins will become extinct," he said. "That would be a sad indictment on society that we cannot look after a creature as special as this."